Theology is, for me, a Trojan Horse. I allowed it through the gates and trusted much too quickly, when suddenly its peaceful presence turned savage; the doors fell open and it revealed its nature. Theology is a force that ravages, that confronts and tears down. Had she known that she was bringing this wooden horse into my fortress, she probably would have turned her lament inward. But the damage had been done. The soldiers of Troy were now waiting patiently in the town square of my stirring mind. “Where is God?” And so, the door swung open, and my mind was torn asunder. Theology, no matter its pedigree, is only so much mental masturbation if we don’t attend to how its propositions take form in the material world. I often grow frustrated with the metaphysics of theo-talk, the ink that is spilled to argue creatio ex nihilo or that dogs do not fly because angels hold them to the earth. When one invokes the name of God, the most obscure notion has consequences. What matters in theology is how its claims are lived out in the world, how they affect those who believe them. A theology may lead some to feed the poor, and some to oppress them, and still others to despair that hope will ever come. Theology has power. It names the unnamed God. It defines, and so determines. “Only the suffering God can help.” So wrote Dietrich Bonhoeffer, a man who lamented his own attempts at stopping the evil wave of Hitler’s Reich. He was a man who spent the remainder of his life in Tegel Prison witnessing the horrors of the concentration camps before his execution in 1945. Only the suffering God can help. It stings my ears, yet I know it to be true. Gary M. Simpson did well to point out that the weight of the statement lies at the beginning: only. Bonhoeffer determines that the only possibility of hope is found in no other theology, no other god than the one defined by suffering. And Bonhoeffer’s continued faithfulness in the face of imprisonment and death is warranted only by the image of the God who suffers alongside him. This is cruciform theology. It is a theology centered on the point where the possibility of God and the inevitability of suffering were merged into a singular moment, a singular event. Bonhoeffer sees in Christ and his crucifixion a demonstration of what is required of God. God must suffer. God must bend beneath its weight. Bonhoeffer rejects the boasting of omnipotence or the tidiness of deus ex machina as trappings of an imperialist god, modeled on imperialist power – a god whose reputation and abilities must be inflated and held distant if God is to be preserved. Instead, he holds fast to a God who suffers. But how can it be that only a suffering God can save us? Surely a god who descends the mount with sword unsheathed and fire in his eyes is able to triumph over evil! But… what does that god know of me? 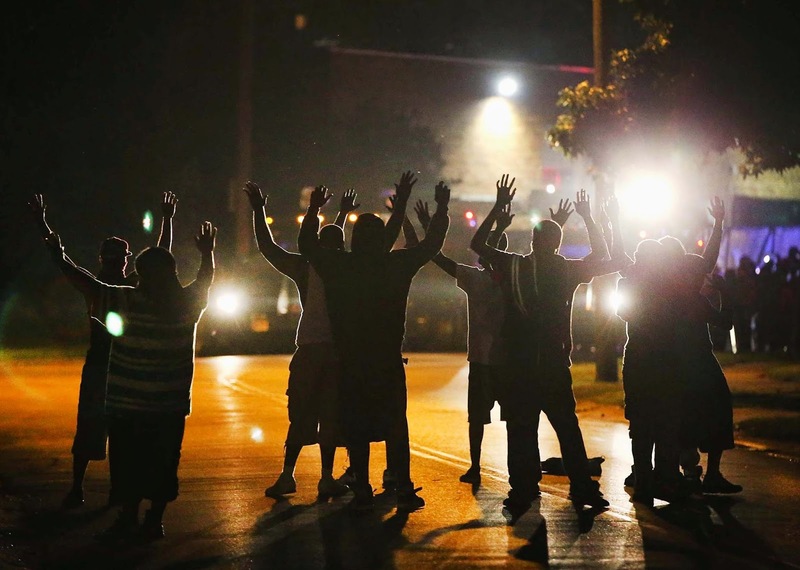 What does that god know of Ferguson? What does that god know of pain except as a provocation for retribution? Not many of us have known power. Not many of us have triumphed in warfare. Not many of us have had the privilege of pulling ourselves up by our own bootstraps. How can we identify with a god like that? How can such a god identify with us? Instead, this world is ripe with stories of people who never knew strength or joy, people who are marred with stories of pain and defeat. What does Superman have to do with anyone but himself? To rally around the omnipotent figure is only to grovel for his good favor, in the hopes that he will stay, in the hopes that he will remain on our side. We share nothing with him, and he shares nothing with us. I have suffered. I have been wounded. I have lost and have mourned, and I bear witness to countless others who have shared in the same. The suffering God is a God who is capable of empathy and identification. The suffering God is ever-present in the hurt and the pains of this world. We all suffer. We all hurt. And in the face of a suffering, crucified God, we find ourselves looking at one of our own. We bear scars, as does he. He lost his name; so have countless others. Empathy and compassion are the real fragrance of the gospel. And so I find myself affirming alongside Bonhoeffer: the suffering God, the crucified God is my only hope. It is our only hope, because suffering is the only human experience we all share in common. We all lament together. We see our pain reflected in others, and others see their pain in us. Seeing neighbors battling depression, friends who lose loved ones, systemic social issues that oppress minorities, all draw from us a deep lamentation that unites us with all humanity. The suffering God is the only one who can truly know us, and who can be truly known. The fullness of God is not found in the warrior arrayed for battle or the splendor of cathedrals. Instead, the fullness of God is discovered to be suffering alongside those who suffer, crying out just as they do. God, then, is the one who is capable of bearing our iniquities, both individually and societally, because God suffers among those who are subject to our evil. God bears the pain of Ferguson, and we cannot help but have a share in it, for the same God bears our own. Kyle Baughman is a human. He studied theology at Fuller Seminary and enjoys the attention he receives from flirting with several different theo-camps. He hits things with sticks as the drummer for Coyotes in Boxes. You can find him on Twitter @truekyleb. You can follow On Pop Theology on Twitter @OnPopTheology or like us on Facebook at www.facebook.com/OnPopTheology. If you'd like to support what we do here, you can donate via the button on the right of the screen.